Today, I would like Mr. Tsuyoshi Miyazawa to introduce a recipe of ‘Konyaku Noodle Soup – Japanese Udon Style’. 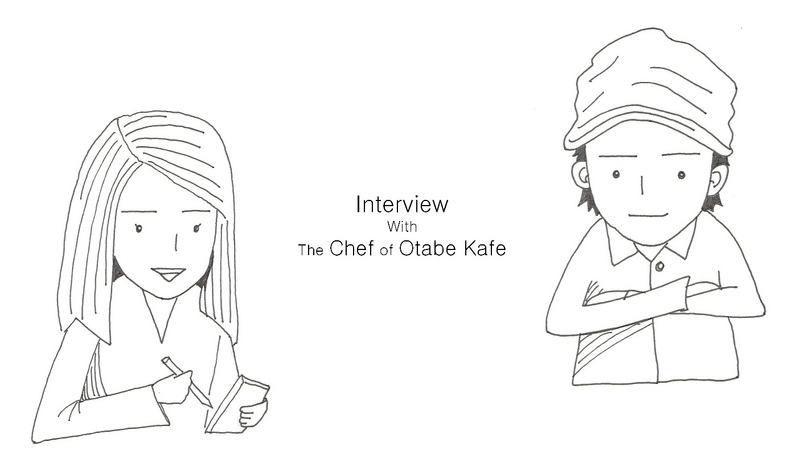 Tsuyoshi was the chef of Otabe Kafe in Putney. The café is now sadly closed but I hope he will open a new one somewhere soon. Thank you for providing the recipe and talking with me today! I would like to say this is one of the most basic soup recipes in Japan and you provide these type of noodles in you café. What was the reaction of the local people to this dish? Well, it seems everyone likes this and most people completely emptied the bowl and even finished all of the soup. I think we, Japanese don’t normally drink all the soup, do we? I only drink some soup with the noodles but I never drink all of it. Yes. When I find there’s some soup left, I always notice they are Japanese (smile). Therefore, I adjust the recipe by putting lots more vegetables on top of the noodles. The vegetables soaked in the Dashi soup are extremely delicious. After they have eaten up all the noodles, they still have some vegetables so that they can enjoy eating them with the soup. I see. That sounds great. And this basic recipe is really good because once you get familiar with it, you can make different dishes by just changing the toppings. For example, when you are busy, you can just put chopped vegetables. When you are really hungry and want to eat it as a main dish, you could put some Tempura (battered seafood or vegetables) on top. It looks gorgeous and Tempura soaked in Dashi soup is just amazing! When I go to an Udon restaurant in Japan, there are lots of items on the menu however most of them are just different toppings. Can you tell us your recommendations of toppings? Well, ‘Smoked salmon & blanched spinach’ and ‘Poached Egg & blanched spinach’ are very good. The easy one is mixed blanched vegetables like carrots, French beans, spinach, celery and celeriac etc. If you just want to add a single item, wakame seaweed is good. Tofu with chopped spring onion is good as well. If you like warm tofu, cut tofu in some small portions and boil them for a bit. Another option is stir fried mushrooms in vegetable oil. For someone who wish to have some animal protein, I recommend stir fried chicken & leek. Visit our Konyaku Noodle Soup recipe and Dashi recipe, then try any toppings whatever you like!